Part 1: What is Renewable Natural Gas? This is the first in a series of blog posts that will highlight the market and environmental potential of renewable natural gas (RNG). Check back over the next six weeks as we explore the issues and opportunities for RNG in the transportation sector. Renewable natural gas (RNG) is pipeline quality gas that can be used like fossil natural gas but is produced from what are called biogas and biomass feedstock sources, the technical term for any renewable, biological material such as plant matter or animal wastes. It can be a substitute for, or be blended with conventional natural gas for use in vehicle engines. RNG is produced in two ways: anaerobic digestion and thermal gasification. 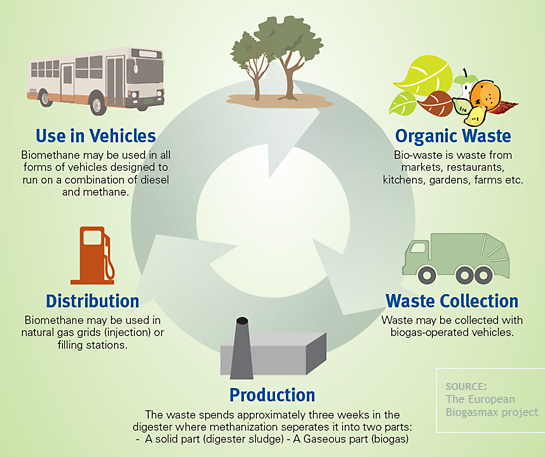 Anaerobic digestion is the most commonly used and well-developed method. It requires only a low-oxygen environment for the organic matter to breakdown naturally by bacteria, and the equipment and process is commercially available. [i] This technique is best suited to using landfill and agricultural waste. The first biogas digester was built over 150 years ago, and the technology’s simplicity makes it appealing for a range of end uses who want alternative fuels, including transportation use. It’s in commercial use for transportation in parts of Europe, led by Sweden and Germany, and in the U.S., mainly California. [iv] Gabriela Vanciu and Nina Miresashvili, “Biogas cars in Sweden: An emerging market,” Jönköping University (May 2012). [v] NGV Journal, “Germany: 18 additional CNG filling stations now provide 100% biomethane,” last updated December 18, 2012, last accessed March 22, 2013. [vi] National Petroleum Council, “Renewable Natural Gas for Transportation: An Overview of the Feedstock Capacity, Economics, and GHG Emission Reduction Benefits of RNG as a Low-Carbon Fuel,” (March 2012). [vii] Floris van Foreest, “Perspectives for Biogas in Europe,” Oxford Institute for Energy Studies Working Paper series (December 2012).